I like to have full control over my fine art printing and like to think I have the best ideas for the pictures I make. I use Epson professional printers with pigment inks and prefer to print on luster finishes. This way you get the detail and depth of glossy photographic paper with better dynamic range and minimal distracting glare. The combination I use has been estimated to retain vibrance without fading for over 60 years under reasonable conditions. My current favorite paper is Hahnemühle Fine Art Baryta and I use it for all larger and limited edition work. It has optical brighteners (OBAs), but I haven't seen any objectionable shift with prints I've had for over a decade and I accept the archival compromise. It's bright with a subtle eggshell texture, will not ripple or warp when mounted correctly, and it is durable. If you've been to one of my shows you know the sharpness, clarity and pop sets my prints apart. These prints will look fantastic mounted on your wall and they'll stay that way. I recommend 100% cotton museum board and acid-free materials. They are the only materials I use for the matted prints I sell. 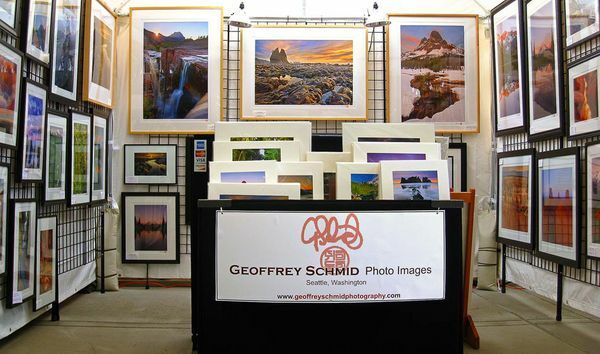 There are many online firms selling what are represented to be gallery-quality prints of my older images. I regret entering into agreements with stock licensing agencies that sold my files to third parties. In most cases these files were never intended to be printed at large sizes. The prints I carefully produce one at a time are the only ones that earn my signature. My work has been published worldwide. All of my images are available for licensing. Please contact me with your terms and uploading requirements. © 1999-2019 Geoffrey Schmid, Seattle, Washington, USA. All rights reserved.